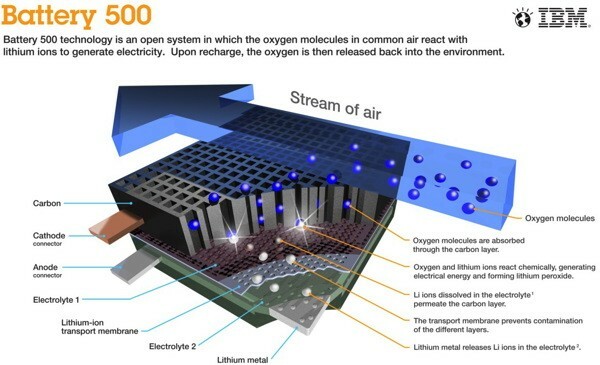 In 2009, IBM researchers set out to develop lithium-air battery technology capable of powering a family-sized electric car for approximately 500 miles (800 km) on a single charge. Instead of using heavy metal oxides, lithium-air batteries borrow oxygen from the air as the vehicle is being driven, creating an air-breathing battery. This results in lighter batteries with high energy density that extend the car's range from a single charge. IBM researchers have successfully demonstrated in the lab the fundamental chemistry of the charge-and-recharge process for lithium-air batteries and, if this bold research project is successful, people could see it in cars between 2020 and 2030. IBM say they will have a lab demo by the end of 2013.